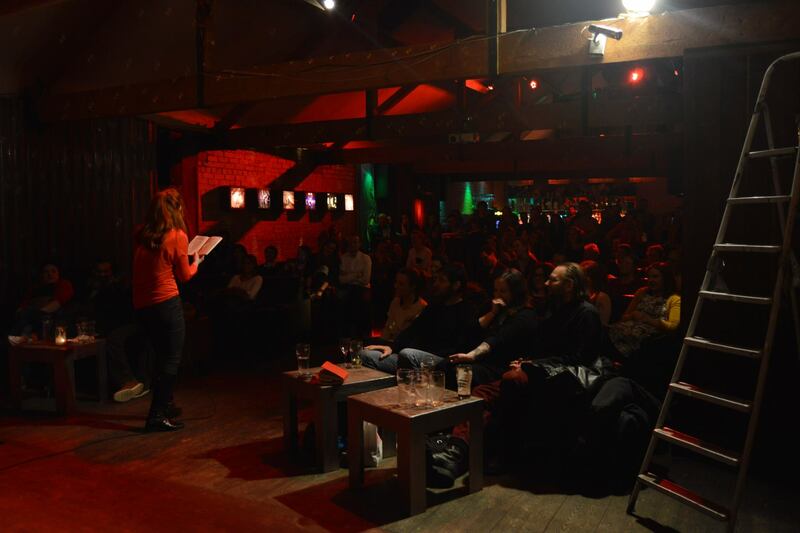 I had never heard of it before, but as soon as I learned about the format—academic researchers give stand-up comedy style sets about their work, alongside comedians and musicians—I knew I wanted to bring it to Dublin. It sounded like a really fun type of variety night to put on, entertaining and thought-provoking and dipping in to all sorts of interesting ideas. Plus for the academics, I loved the idea of public engagement that uses humour, and they receive training to develop a set with real jokes that may be massively different from anything they’ve done before. To paraphrase Richard Feynman, everything is interesting if you go into it deeply enough, but everything is funny if you look at it the right way. So I wrote to Steve Cross, who came up with the idea and ran it in London, and he kindly gave his advice and his blessing for me to start a Bright Club in Dublin. Before the first event, I will admit that I had some difficulty getting people to agree to do Bright Club. Academics would say, “wait, I have to be funny?” Comedians would say, “wait, is the audience going to be all academics?” We sat down to do the speaker training, and an alarming fraction of the room gave their reason for being there as “Jessamyn twisted my arm!” And I had a nagging fear that I was designing the perfect variety night for me, but maybe other people would want something different… I wanted people from across physical science, social science, and humanities, but maybe an audience would prefer strictly science or strictly art, so was anyone else actually going to turn up? Fortunately they did, the first event was a splendid success, and it got a lot easier to fill lineups for Bright Club once I could point to past shows, and past speakers who’d had a great time. While I could still reach out to my networks in academia and comedy, people were now coming to me to ask to be in Bright Club! I was also fortunate that the outreach office of the institute I work in, AMBER, agreed to help fund the early events. They took a chance on a crazy idea I brought to them, and it helped the thing get off the ground. Soon conferences like Sci:Com and the Society for Applied Microbiology were asking for Bright Clubs with their events. And now, I am delighted to have Science Foundation Ireland onboard as a sponsor alongside AMBER, which has enabled me to broaden the team of people involved in making Bright Club great. Humour is a great way to engage with complex subjects—how many people watch The Daily Show or Last Week Tonight or Weekly Wipe instead of straight news shows? But the bottom line is, Bright Club is fun to be at and a joy to MC and run. If you’re in Dublin, you can swing by our next show on January 29th! And if you’re somewhere else, we’ll be putting videos online soon, or you can always follow us on facebook and twitter.